"The one characteristic of a beautiful form is that one can put into it whatever one wishes, and see in it whatever one wishes to see; and the Beauty, that gives to creation its universal and aesthetic element, makes the critic a creator in his turn, and whispers of a thousand different things which were not present in the mind of him who carved the statue or painted the panel or graved the gem." - Oscar Wilde, "The Critic as Artist"
Trapped in an impossible choice, Mike accepts his mission and is returned to an Earth—and a body—so unlike his own. There, he meets Jane, who is—unbeknownst to him—the secret leader of an organization bent on tracking down Earth's saboteur. In the face of her passion for humanity, Mike's resolve falters. If Mike won't complete his mission, the gods will. When I heard about this book, I was dubious. The premise sounded… odd. But something made me pick it up anyway. And for that I’m very glad because as soon as I started reading Challenges of the Gods, I fell in love. Wait… I just realized the title is a wordplay thing. 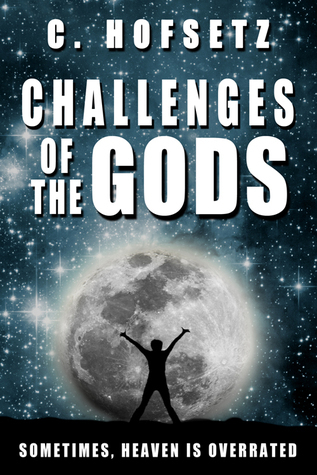 Cause like, the gods have challenges but also the gods assign challenges to the people in the book and… never mind. Let’s move on. Turns out the premise is slightly misleading (*spoilers ahead—but like, spoilers you find out in the first two chapters*): the main character doesn’t die and go to heaven. At first, when he finds himself inexplicably in a strange alien landscape, he thinks he’s died and gone to heaven. The truth is much more complicated—and terrifying. Because there’s another variable in this game: someone from Earth has been sent to our hero’s planet—and now he has to destroy Earth before his own planet gets wiped out. As you can imagine, various complications arise. Not the least of which being our hero’s growing affection for the people of Earth, and his stark sense of morality (planetary genocide is a hard thing to sleep with at night). Meanwhile, every night he returns to the realm of the messengers, where he engages in a series of war games against the people of Earth. Oh yeah, no one on Earth knows who he really is, and he manages to assimilate very well into their team. So it’s a bit like The Hunger Games meets The Night Manager meets Ender’s Game. It’s also heck of good. I was alternately fascinated, terrified, heartbroken, shocked, enraged, and relieved. But through it all, riveted. The narrator has a great sense of humor, and when he dryly points out the differences between his planet and our Earth, it’s funny in that (almost) Hitchhiker’s Guide to the Galaxy kind of way. You laugh, and then you think, wait, but why is it like that? Not only does it make you question stuff like the social customs we have on Earth, it makes you appreciate the way things are on this planet. Like, we have a moon and it’s beautiful. Do other planets have moons in their skies? What if we didn’t have the moon? Or what if it was too far away to see? Just another tiny star in the night sky? What if someone who’d never seen the moon before came to our planet and looked up at night. What would they think they were seeing? It’s the differences as well as the commonalities between alien races of people that form the heart of this story. And maybe, at heart, it’s about connection—finding it, making it, or just looking for it. But that’s not the whole of the story. Challenges of the Gods is a thrilling page-turner. It’s an interplanetary spy drama with plenty of twists and turns, mysteries, moments you never saw coming, epic sci-fi battles, and romance. Also, a quick round of applause for awesome character development. Before I wrap this up, can I mention how hard it is to end a good book? It’s hard for the reader. It’s hard for the writer. But let’s talk about the writer for a moment. And this isn’t just a problem for books. I’m sure everyone can think of some form of entertainment—movie, play, TV show, book, even a comedy sketch—that left you wanting more at the end. Maybe it was totally awesome all the way through, but then it ended and you went, “What?” Or maybe it ended and you sat there scratching your head for a minute, wondering why you didn’t feel satisfied. This book is not like that. Holy cow it has the most satisfying, beautiful, perfect eucatastrophe (Thanks, Tolkien) of an ending. And then I had to face the fact that it was over and yes, ending a good book is also hard for the reader. The Wood Between the Worlds is dedicated to bringing you great book reviews, movie reviews, play reviews, and even music reviews. Looking for your next favorite book? Find it here. Have a book you'd like us to review? Give us a shout.